Please note that due to the innovation of our business payment methods our guides are often subject to adjustment. Therefore the below information may change without notice. However a complete up-to-date guide will be provided once your account has been activated. 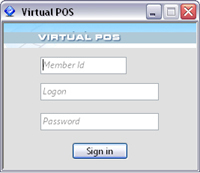 The Virtual POS is a Windows based software application that provides all the necessary features to process credit and debit card transactions quickly and easily, in environments where cards are not present. Please note that currently the VPOS can not run on Apple MAC applications. Therefore you will need to use Bootcamp or some other Virtual Machine to run the Windows application on your computer. Once your account is activated you will be sent details of how to access you VPOS including user guides. Logging on you will be prompted to enter a member Id, logon and password that will have been supplied to you. Left menu with the Available Operations that are described below. Top bar with User Management button. Bottom section with a grid containing the results of each transaction. Main section to introduce the information required for each operation. This is the easiest and suggested way to bill an amount over a card. Payment is the default option selected when you log on the Virtual POS. The Payment operation immediately collects the amount desired from the card holder account. Once this option is selected the main section screen will change to request the necessary information to execute the operation. The information is composed by the next sections. Currency: Currency of the amount. Amount: Amount that will be invoiced to the card holder. Country: Country of the card holder. If you do not have this information you can introduce it as Unknown. Merchant Account Type: Type of Merchant Account, for Virtual POS its value is MO/TO. 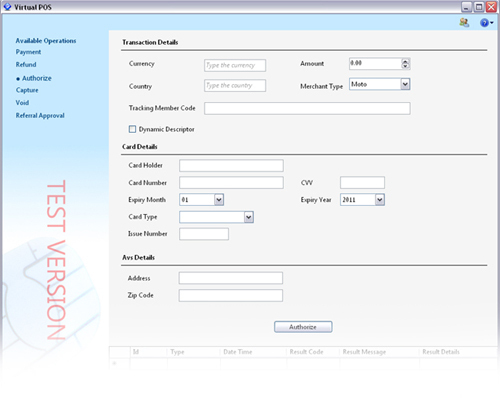 Tracking Member Code: This value is mandatory and acts as a unique identifier, most customers use it as the invoice or order number. The identifier used must be unique in a 24 hour period. Dynamic Descriptor: Indicates if the descriptor appearing in the card holder statements needs to be replaced. This feature needs to be previously agreed otherwise values introduced will be ignored. The Currency and Country text boxes are compliant with both ISO 4217 currency and ISO 3166 country standards and will translate these codes to more human friendly values during entry. Users will find this grid particularly convenient as it displays all the transaction operations performed and the details associated with the currently highlighted transaction. 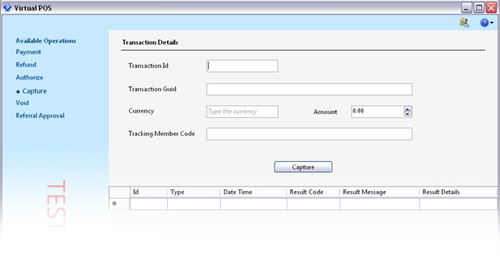 For example, “Right Clicking” a transaction will display a contextual menu with the different actions available for this particular transaction. i.e. The figure below shows the menu displayed for an authorized Payment, for which you can display the transaction details or immediately execute a Refund. 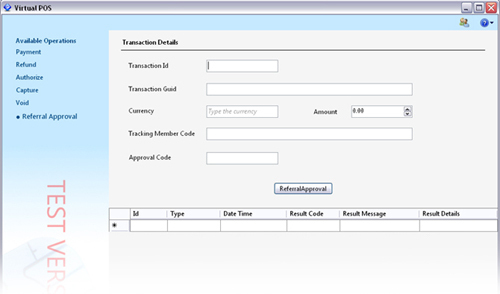 The Transaction Details option will display a neat summary of the information associated with the current transaction. This option can also be displayed by “double clicking” on a transaction. To expand, several operations may require/expose subsequent operations that may be performed on a particular transaction. For example, a successful Authorization may result in an attempted Capture or it may be necessary to rollback a previous transaction i.e. refunding a payment or voiding an authorization. Executing subsequent operations from the contextual menu will open a new window to perform the requested transaction with all the known fields automatically filled. The figure below shows an example for a Refund operation. 2. Reset a forgotten password. 3. Activate and deactivate current user accounts. 4. View all currently active and inactive users. The Refund operation, as the name states, consists of returning the money already collected by a Payment or a Capture transaction. The amount collected can be refunded in total or partially. You cannot refund amounts bigger than the one sent in the original transaction. Refund can only be performed if a customer has not initiated a chargeback procedure. In this case you must dispute the chargeback according to the standard procedure. Note: You can perform multiple refunds until the total amount of the original Payment, or Capture is reached. The list below describes the different fields you need to complete to perform a Refund. 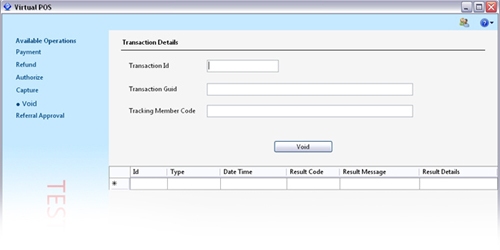 Transaction Id: This is the identifier of the Payment or Capture transaction you want to Refund. Transaction Guid: The Global Unique Identifier of the Payment or Capture transaction you want to Refund. Currency: Currency of the amount, it must be the same as the original Payment or Capture. Amount: Amount you want to Refund to the card holder. 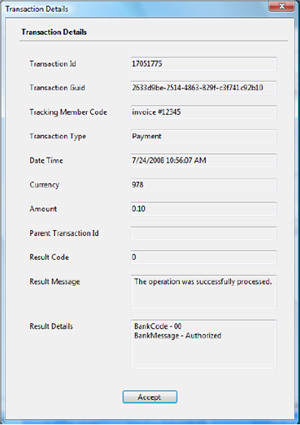 Tracking Member Code: Tracking code used to identify the transaction. The Authorize operation allows the merchant to book the desired money from the card that will be invoiced. It provides the bank authorization to collect the money from the customer, but without collecting it immediately. This operation has two-steps and must be always completed by voiding the transaction or capturing it. The completion can be done within 7 days from the Virtual POS or Reporter. If the Capture is not performed, the Engine will purge authorizations older than 7 days. This means that you will not be able to capture authorizations after they are purged and the money will not be deducted. NOTE: If you don’t execute a Void operation, the money of purged authorizations will be blocked for the card until the issuing bank releases it. In order to avoid this you should always call the Void method. The Authorize operation requires exactly the same fields as Payment. The Capture operation consists of collecting the money from authorizations previously done. Normally a Capture is performed for the total amount of the transaction, but it might be possible to capture only part of the money reserved. Note: Only one Capture operation can be performed per Authorization. The fields that need to be sent to perform a Capture are exactly the same as the Refund operation. The Void operation is used release the money blocked on the credit card from previous authorizations. The Void can only be performed for the total amount of the Authorization, if a Capture or Partial Capture exists, the Void operation will not be performed. Transaction Guid: The Unique Identifier of the Payment or Capture transaction you want to Refund. During an Authorize or Payment it is possible that a transaction is neither declined nor approved, instead you get a Referral. The most common case for this error includes large transactions. When a Referral occurs, the bank requires an extra authorization via telephone as an additional security measure. The procedure to follow in order to get your transaction approved consists of calling the Authorization Center, where you will obtain an Approval Code, after this step you will need to perform a Referral / Approval request. This feature is not available for all acquiring banks; please contact tech support to know the specific procedure to follow with each acquiring bank.